When you think of the modern SUV, you may think of a large bodied vehicle with overpriced features that will break the bank. The 2019 Volkswagen Tiguan is quite the contrary. A midsize SUV that has industry leading design, sharp exterior features, exterior LED lighting from front to back, an accommodating 3rd row with interior styling that is sure to please the toughest critics, yet at a budget-friendly price. Versatility and intuitive technology design are of the utmost concerns for consumers to ensure they get the most out of their driving experience. Oh, did I forget to mention a turbocharged engine that is not only ideal for fun, but fuel efficiency? That’s right, and backed up by an 8-speed automatic transmission with sport mode for those days you want a “little something extra” on your daily commute. Let’s take a deeper look into the drivetrain, and break it down a bit further. That turbocharged engine that I mentioned is a 2.0L TSI engine with 184 horsepower and 221 lb-ft of torque. The 8-speed transmission allows for superior shift points that create seamless transitions between gears for optimal fuel efficiency, allowing for 22city/29hwy. 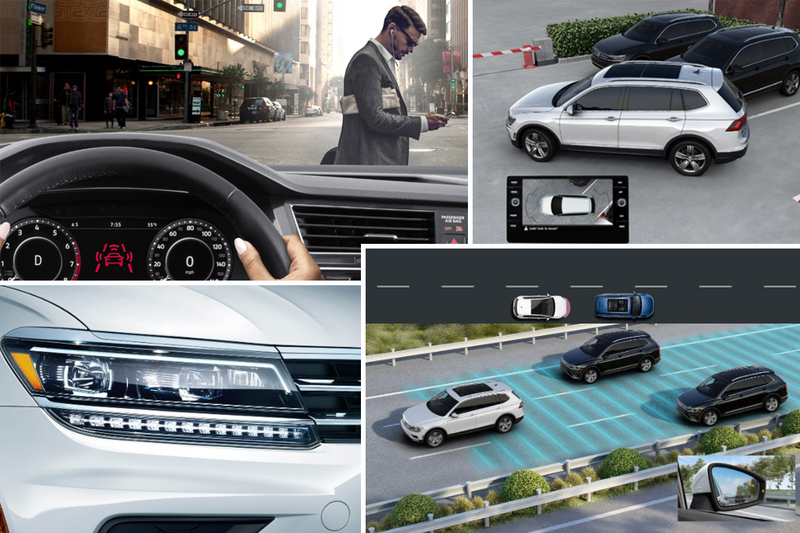 If you are looking for a more custom, tailored drive, you may be excited to know about the four driving modes that the Tiguan has the offer. First on the list is On-Road Mode. This is for your normal everyday driving conditions on paved roads where traction should remain consistent. Off-Road Mode can assist with irregular road surfaces, so you can maintain optimal traction. You may find Hill Descent Control helpful on steep grades that will control your speed as you descend as an extra precaution to keep your precious cargo safe. Next on the list, or should I say dial, is the Off-Road Custom Mode. This will allow you to further customize drivetrain settings like the AWD to your personal needs. Lastly is Snow Mode. 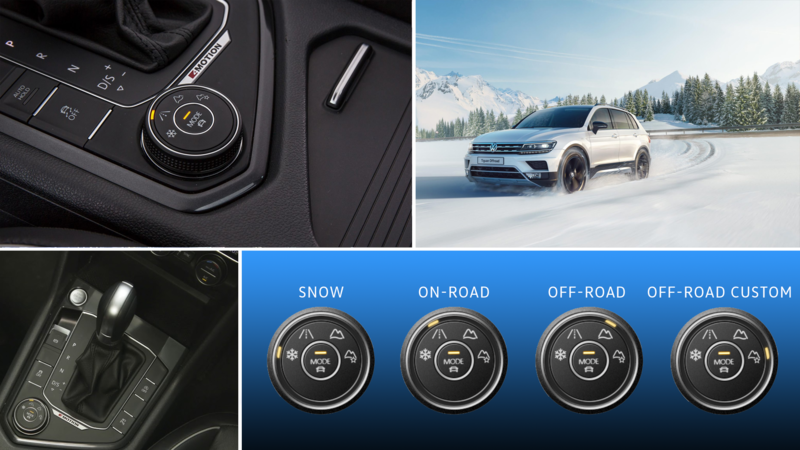 Snow Mode will cater to the power transfer throughout all four wheels. The engine will “short shift” which allows for the vehicle to maintain stability in slippery conditions. What this means is the engine will remain at lower RPMs to ensure there is no overabundance of power transferred to the wheels when it is not needed, and to prevent loss of traction when it is most important. Upon entering the interior you will notice the elegant Vienna leather seating surface colors in storm gray, or saffrano orange that offer a unique look with the comfort for those long road trips. Once you seat yourself within the luxury in motion, you will notice the convenience of dual-zone climate control which will keep your passenger satisfied with the temperature of their liking. Just above the climate controls is the available 8” touchscreen navigation system, including Android Auto and Apple CarPlay, that is easy to control and navigate. Are you a fan of creating your own concert on the road? Well, let the Fender Premium Audio System aid in helping bring that concert to the next level with a 480-watt amp and nine speakers of crystal clear performance. 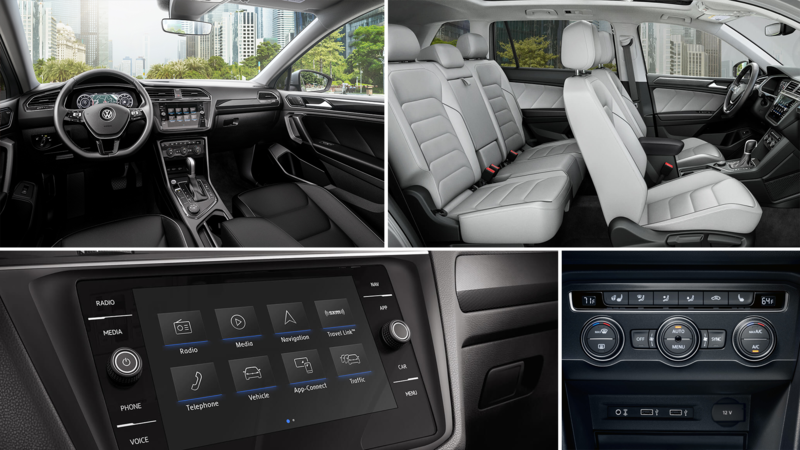 My absolute favorite feature of the 2019 Volkswagen Tiguan is undoubtedly the Volkswagen Digital Cockpit. It has a high resolution digital display that will provide you with all the information you need for your daily commute. Within the brilliant display you will be able to keep tabs on a number of items including direction of travel, time, outside temperature, and odometer/trip meter. 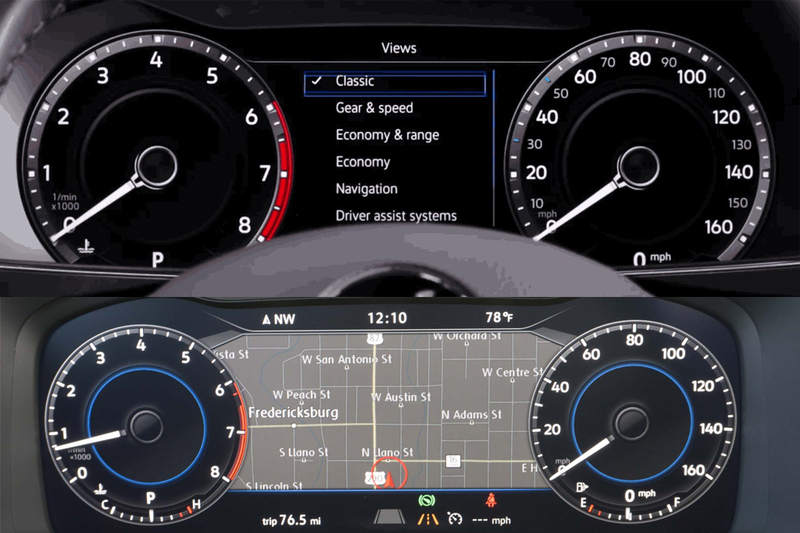 The most useful feature of the Volkswagen Digital Cockpit is the Wide Map Navigation View. You can keep your eyes on the road and quickly glance down to take notice of your next turn. You know you will find all the latest tech inside and out, but what makes the Tiguan great are all the safety features to further protect your precious cargo. These include Adaptive Cruise Control, Lane Assist, Park Distance Control with Maneuver Braking, Front Assist, Overhead View Camera, and Pedestrian Monitoring. There is a long laundry list of safety features that will ease your mind on every drive. Once you have the please of experiencing them, you won’t want to go without. With over 10 trim packages to choose from, a wide selection of exterior colors, amazing safety features, intelligent entertainment & audio, and a drivetrain that will make the right moves for you, why not come check one out, so you can finally be done reading this blog? 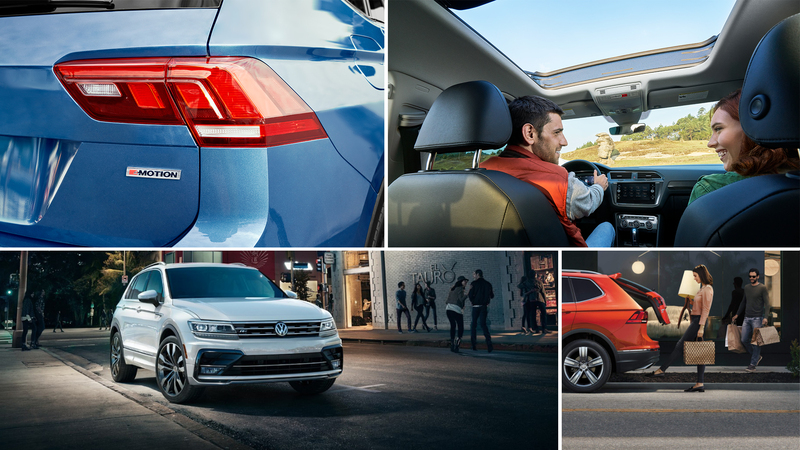 At an affordable price point, the 2019 Volkswagen Tiguan is worth a second, and maybe even a third look, but you may find it will only take a single glance to fall in love. If the sporty appearance or tech doesn’t make you fall in love, The People’s First Warranty just might. The 6 years/72,000 miles bumper-to-bumper warranty will give you peace of mind and provides another reason to trust the long-loved brand.